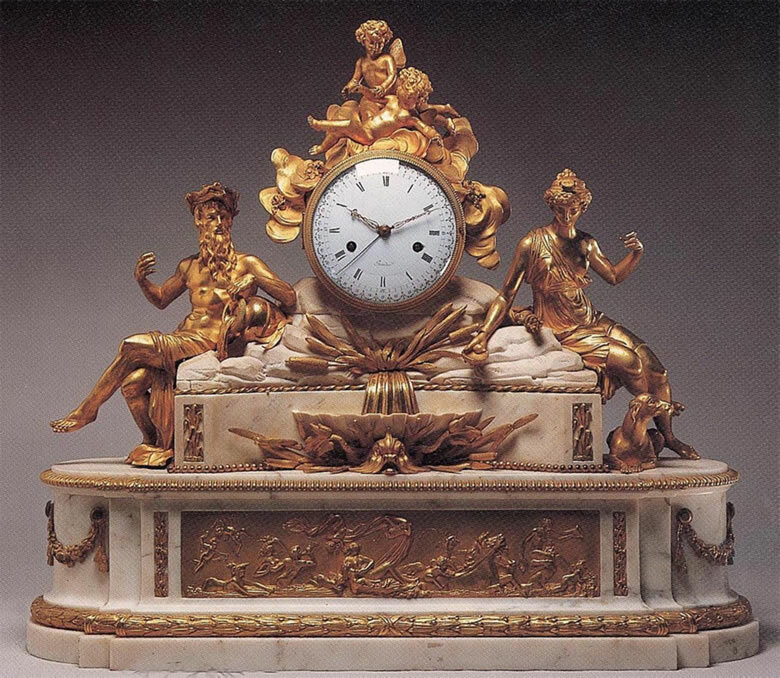 Large Louis XVI ormoulu and white marble mantel clock with original gilding. The white jeweled enamel dial is painted with black Roman and Arabic numerals showing time and date and is inscribed Bourdier. The striking movement, contained within a drum-shaped case, is surmounted by an ormoulu group of playful putti on cloud banks. The movement is raised on white marble rockwork centered by an ormoulu fountain cast with bull rushes and a dolphin mask and is flanked by the figures of a River God and Diana in full relief. The elliptical base, of breakfront outline, is fitted with an ormoulu plaque depicting an allegorical scene. The conforming stepped base is surrounded by an ormoulu laurel wreath border.